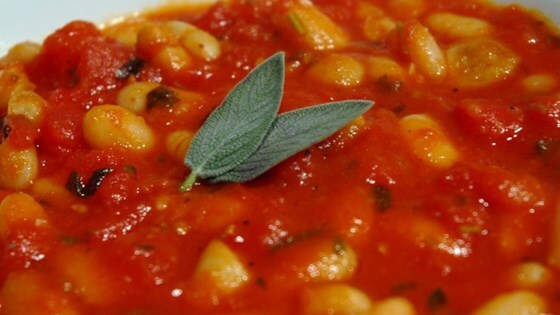 "White beans and tomatoes combine with the light flavors of white wine, sage, and thyme in a stew with a chili-like consistency. So easy and satisfying." Heat the olive oil in a large saucepan over medium heat. Add garlic, and saute until lightly browned. Pour in the white wine, and simmer for a minute. Pour in the tomatoes with juice and water, and season with pepper, sage, thyme, and the bay leaf. Bring to a boil, and let simmer for about 20 minutes. Pour in the beans, and simmer for another 20 minutes or so, until the stew is thickened and flavors have blended. Remove the bay leaf, taste, and season with salt and pepper before serving. Tasty stew with nice combination of herbs. Be prepared for major popping and splatters when you pour in the wine!! I recommend you have a lid handy to cover the pan to protect yourself!! Very-very tasty stew! Great combination of herbs. I used garbanzos instead of white beans and it turned out wonderful. I found this tasty and easy but not something I would rush to make again.